CEO of Booking.com Darren Huston on Direct Bookings vs OTAs says emphatically that Booking.com is the cheapest way for hotels to market: “First of all, we always pride ourselves on being the cheapest way to do your marketing. If you ask any owner, or any hotel, why they’re all on Booking.com, when they can all leave tomorrow, the reason is, it’s the cheapest way to do paid marketing.” He says. Well that is a bold statement. But is it true? Is he saying that OTAs are the cheapest paid marketing, or that his company, an OTA, is a better deal that all the other OTAs. The later is simply not correct, I know of hotels that deal with both Expedia and Bookings.com and both require the same 15% commission. Now that 15% can vary, and it does, across the landscape. 15% is just a starting rate, it goes up for better placement and additional marketing options, and there are differences in the way they work. But, I think we need some more comment from Darren if he really means Booking.com is a cheaper than all OTAs and all other alternatives. OTAs are a vital part of the marketing mix, but are they cheaper than all direct marketing? Maybe yes if you are comparing to Google Adwords paid adverting but what about Social Media Ads, Search Engine Marketing (SEO) and content marketing. Maybe in some cases but not in all. Its also important to remember that hotels need to build their own brand identity, integrety and loyalty and that means having a direct marketing plan. 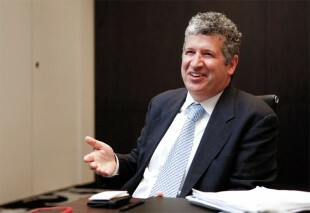 In the interview with Sarah Williams, October 21st, 2015 Daren is speaking about the experience in Dubai where he was Huston explore new venues, and about “Priceline Group’s recent activity includes launching a new B2B booking vertical, Booking for Business, as well as restaurant booking site OpenTable.com”. The group’s websites include Booking.com, Priceline.com, Agoda.com, Kayak.com, Rentalcars.com and OpenTable.com. It is an interesting discussion from the point of view of what is happening in Dubai and how advanced hoteliers are there in understanding the online and e-commerce perspective. Hoteliers big and small are trying to build their direct business as it has a number of advantages and its not all all all to do with price. It’s actually more to do with control, and brand integrity. Ownership of the customer base, maintenance of Brand identity and the ability to resell, up-sell, head of objections and capture leads and convert prospect is not something that hotels should give up even if they love the OTAs. 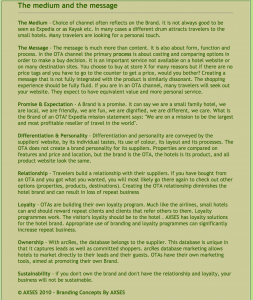 OTAs are quick to offer alternative hotels and often treat rooms as a commodity across all brands.